[Oxford, England] – A ballet dancer who dreams of dancing the world’s stages is set to join a top London performing arts school. Ten-year-old Bobby Ratcliffe will follow in the footsteps of super model Naomi Campbell and the lead singer of Genesis Phil Collins when he starts lessons at the Barbara Speake Stage School in London. 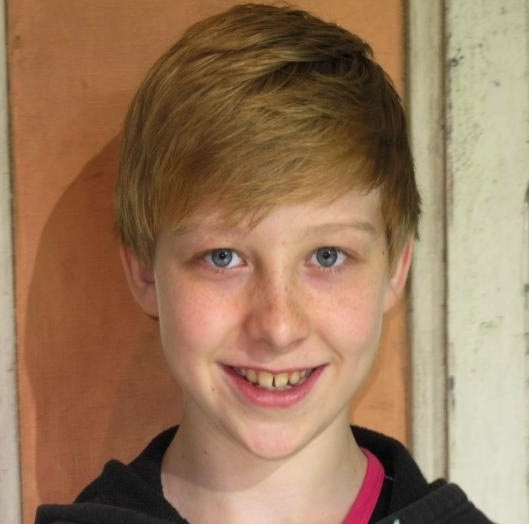 The Banbury youngster has also landed himself a second audition for the hit London musical Billy Elliot. Bobby was one of 180 young people at the first audition at the Royal Academy of Dramatic Art in London, He was thrilled to get a callback to play the role of Billy Elliot’s best friend Michael and will be one of 25 young hopefuls at auditions at the end of the month. The St John’s Priory School pupil has regular lessons at the Susan Taylor Dance Academy in Banbury, where for a long time, he was the only male pupil in attendance. Bobby is one of two pupils who has been awarded a scholarship for the Barbara Speake Stage School in East Acton, and will start classes in September. Pupils study at the performing arts school until the age of 16. Proud mum Hayley Thompson, 31, who works in child protection at the Warriner School in Bloxham, said: “He has always been a dancer. He does ballet and modern and he just really enjoys it. Noah Parets is a kid who loves to dance and dreams of making it big, and in Billy Elliot, he plays one, too. But while he relaxes in West Palm Beach, Florida, before playing the role—one so gruelling he has to share it with three other boys—Parets admits there were other obstacles to following his dream. That’s the kind of dedication it takes to tackle this touring show. Not only is Parets on the road, with his mom, for huge chunks of the year—when he takes the stage, he stays there for about 90 percent of the production, pulling off increasingly killer moves as Elliot tries to escape his small, Northern England mining town and get into the Royal Ballet School. Parets’s schedule off-stage is just as demanding. “On the first day in a city, we’ll have school for about five hours, and cardio training and then any needed rehearsals and an acrobatic class as well. Then we have to be at the theatre an hour and a half before the show starts for preshow safety things.” Parets loves the acrobatics the most; he’d never done it before but now can pull off a mean back flip. Not surprisingly, the cast and crew have become a second family to Parets, who insists he tries to find plenty of time for play. “We hang out with the other kids. There’s actually 17 kids on this production, so we watch TV or hang out at the pool,” he says. Still, the production is not all fun and games—behind the scenes, or in the action on-stage, as it turns out. It has a darker theatrical depth than a lot of glitzy touring shows. One of its most tormented characters is Billy’s older brother Tony, a coal miner who chastises the boy for wanting to become a dancer. Cullen Titmas, who is somewhere around his 460th performance as Tony when we reach him further up the tour road in Peoria, Illinois, seems to relish the meaty role. The unfortunate side effect of all that anger, he sometimes thinks, is that the kids don’t want to get too close to him when he’s off the stage. That doesn’t mean he fails to marvel at the discipline and talent of the young Billys he works with: most of them are high achievers who are excelling beyond their grade levels at school while becoming Broadway stars. 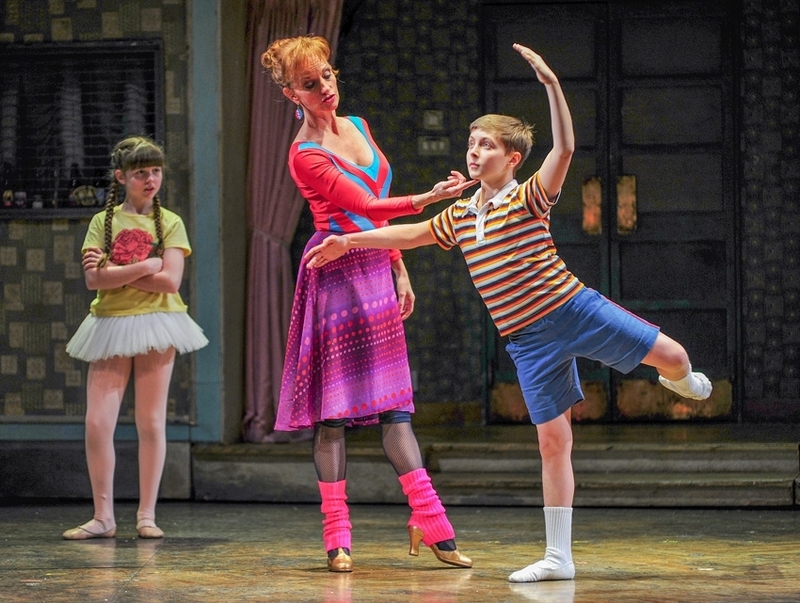 Billy Elliot is at the Queen Elizabeth Theatre from Tuesday to next Sunday (April 2 to 7). [Boca Raton, Florida, USA] – It is a long way from singing and dancing on the living room coffee table to starring in a hit Broadway musical that tours the performing arts centers of the nation. But that is the journey of 12-year-old Mitchell Tobin of Boca Raton, who appears this week at the Kravis Center as “Billy Elliot,” in the musical about a Northern England coal miner’s son who yearns to dance. A student at the Bak Middle School of the Arts, Tobin can pinpoint the time he realized what he wanted to do with his talents. 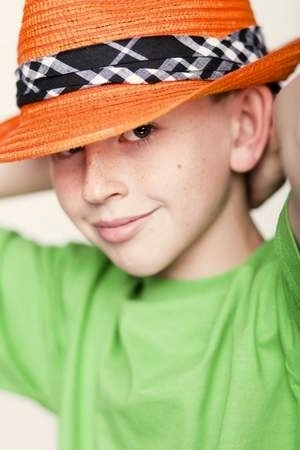 “I’ve been wanting to be in ‘Billy Elliot’ for almost four years, ever since I saw the show when I was nine,” he says. Mitchell began dancing at the age of 3, tagging along to his older sister’s dance classes. By 4, he was vying in dance competitions and performing solos by the time he was 5. 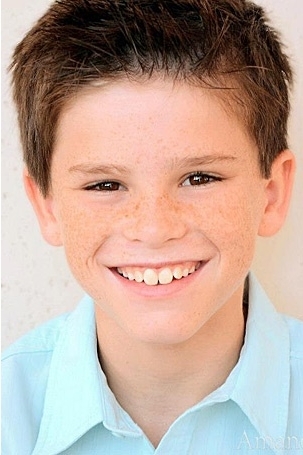 By [age] 9, a casting director for “Billy Elliot” saw him dance at an open call in Orlando. “She saw something in him and would call me every year and would have me bring him back for a follow-up,” says Tobin. Small for his age, it was not until Mitchell grew enough to fit the role that the auditioning began in earnest. The role requires Mitchell to be proficient in tap, ballet, modern dance and a bit of hip-hop. He was already a competitive tap champion, and he picked up the other dance styles in rehearsals. Two friends, two great talents and one great school – Tring Park pupils, Kaine Ward (aged 12) and Alfie Manser (aged 10) have proved that friendship and talent can sit side by side, especially when nurtured in a place like Tring Park School for the Performing Arts. Both boys had no expectations when they auditioned for the renowned West End show Billy Elliot back in February 2010; apart from finding out what a West End audition was like. However, their talent for drama and dance was noticed with Kaine securing the title role of Billy Elliot, at the Victoria Palace Theatre while Alfie was asked by the show’s choreographer to star in The Royal Shakespeare Company’s production of Roald Dahl’s Matilda The Musical at the Cambridge Theatre in the West End. Kaine Ward, first started dancing aged 2, when encouraged by his mum, he attended a friend’s local dance school where he performed ballet, tap and modern. His talent was soon noticed and he went on to star in productions of Annie, as Sandy the dog, and in Bugsy Malone as Leroy Smith. At aged 6, he joined a local drama group where his commitment and passion for drama and dancing continued. By the age of 10, it was obvious that he was destined for greater things and joined specialist dance and performing arts school, Tring Park as a day pupil. In 2008, he won the School’s Paul Watson bursary, allowing him free evening and weekend dance classes for a year. Within a few weeks, he qualified for the Music and Dance Scheme (MDS) scholarship which allows him to study as a day pupil at the school, a centre of excellence both vocationally and academically. Then in the Summer of 2011, Kaine got the call which has changed his life forever and propelled him into theatre stardom from the producers of Billy Elliot; asking him to join the cast from November 2011 in the lead role of Billy. As part of the role, Kaine has had to learn a Geordie accent and practice back flips. 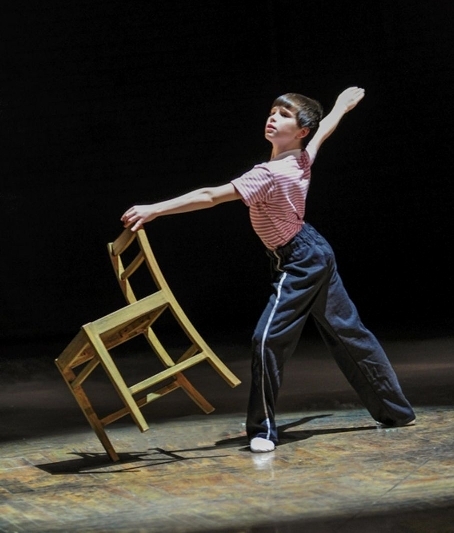 Alfie Manser’s story in some ways parallels that of the character of Billy Elliot. Aged 7, he became obsessed with break-dancing which, in turn, led him to learn how to dance other disciplines such as jazz. However, as his interest and ability grew, his passion started to alienate him at school with his friends teasing him about this dancing to the point when eventually he left school to be home tutored. His mum, realising that it was more than just a hobby for Alfie, decided that he needed to be at a school where he would be supported and surrounded by similar-minded pupils and teachers. In 2009, aged 8, Alfie started at Tring Park as a day pupil in the prep department. Finding his feet and friends at Tring Park, he soon discovered that a few friends, including Kaine, were going to the Billy Elliot auditions and thought it might be good to see how a West End audition worked so asked if he could accompany them. Encouraged by his friends and family, he ended up auditioning for Billy and although he was too young and small for the role of Billy, Peter Darling, the choreographer, asked him to join the cast of Matilda The Musical as well as invited him to the Billy Elliot summer school. Alfie plays Nigel, Matilda’s friend, at the Cambridge Theatre in Covent Garden, two evenings a week, while still attending Tring Park. • Tring Park offers a unique opportunity for gifted young people to specialise in Dance, Drama, Musical Theatre or Music, while gaining an excellent academic education to GCSE, BTEC and ‘A’ level. • Housed in a former Rothschild mansion and set in beautiful grounds, the School is located in Tring. • Figures from the Department for Schools, Children and Families for the summer exams 2010 demonstrate that the school provides an “added value” for pupils’ performance that is in the top 25% in the country. It is 9:15 in the morning, and Ty Forhan is waiting outside the Innovation Room at the Kimmel Center in Philadelphia, sipping from a holiday-red Starbucks cup nearly the size of his head. He cannot believe he is up this early. He is 13 years old. He shakes his blond hair and says, not in so many words, how very tired he is, drawing out his PG-13 descriptor of choice for emphasis. Ballet class will be followed by eight hours of scene reviews, photo shoots, acrobatics class and more dance rehearsals. Often his day starts with at least an hour of individual tutoring. But this hectic marathon is what will prepare Ty for tonight when he walks on stage as the star of “Billy Elliot,” a role he shares with the four other bedheaded and blurry-eyed boys ambling into the studio. The tour comes to the Kennedy Center Dec. 13. They love being Billy because they are real-life Billys: bullied ballet dancers turned hometown heroes. “Billy Elliot,” the Tony Award-winning musical based on the 2000 film of the same name, centers around Billy, a talented English boy who grows to love ballet as his family and neighborhood suffer from the U.K. miners’ strike in the 1980s. Billy’s dreams of attending a ballet school are threatened by his father’s disapproval. 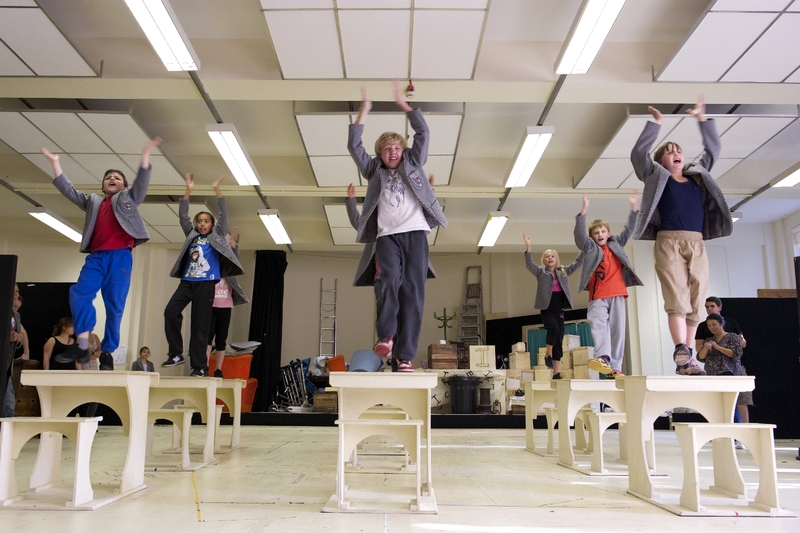 The BGs, in cast shorthand, are eight ballerinas between 10 and 14 who make up Billy’s dance class in the show. They don tutus and pigtails while doing some heavy theatrical lifting, performing in seven of the show’s 15 numbers. They are exactly as cute as they sound. But the boys would like to reiterate: the relationship is strictly professional. “There’s nothing going on,” says J.P.
“Not at the moment,” Kylend clarifies. “Even though one of the girls started a rumor that there was!” says Ty, setting the record straight. They’ve just returned from a brief sightseeing break, a stop outside the Philadelphia Museum of Art at the “Rocky steps” made famous by the Sylvester Stallone movies (a series which, appropriately enough, follows the travail and ultimate triumph of an underdog). “We put a tutu on the Rocky statue,” reported Lex. Now the boys are eating lunch, swiping french fries from one another as they wrap up just about the only downtime they’ll get all day. Though the work is virtually nonstop, they’re having fun—certainly more fun than they had in school. The other boys nod vigorously. Each was the only male in his dance class, Zach the only one in his entire studio. The trajectory of Billy mirrors their own: They’re outsiders who get to be the ultimate insiders, finally surrounded by people who think there’s nothing cooler than a guy who comes with his own tap shoes. “He started singing before we got here just now,” says J.P.
After acrobatics class, Kylend and his mom, Karon, leave the Kimmel Center for the Academy of Music down the street, where he has scene rehearsals. All the boys travel with chaperones and stay in the same hotel (adult cast members stay in nearby accommodations). Karon remembers the teasing as clearly as Kylend does. “Girls were worse than boys,” she says. “They were jealous of what he could do. But all the kids were mean. He never got invited to a birthday party. Never got invited to a sleepover. Karon was a cheerleader in high school, and she worries her son will miss out on homecoming dances and pep rallies, the typical teen tropes John Hughes movies are made of. And “Billy Elliot” is a rough gig for a parent. Her husband and other son are at home in L.A. with the family dog while she and Kylend tour. “And I did,” he pipes in. The “Billy Elliot” tour is open-ended, but whenever it’s over, J.P. looks forward to attending a traditional high school back home in San Francisco. He wants to focus on math and science, his favorite subjects. “I love you, J.P.,” Kylend says when he hears this. “But what kind of idiot would go from ‘Billy Elliot’ to high school?” He spits the words “high school” out as though they’re the name of some disgusting, highly contagious disease. Kylend plans to head to L.A. and try his luck at television and movies. Zach wants to attend an arts high school, and Lex, from Irvine, Calif., is hoping to continue with dance; his specialty is hip-hop. Ty, an Ontario native, just wants to keep doing what he’s doing, though he’s bound to hit a rough patch soon: too old for children’s roles, too young for male leads. But tonight that doesn’t matter because Ty is Billy Elliot, and the show is about to end. He is tapping through “Finale,” his favorite number. The clackety-clack of the cast’s feet fills the theater, and the audience is in standing-ovation mode, clapping along. Though Ty has spent the night speaking in Billy’s Geordie accent (sample dialogue: “Just becoz I do ballih dohsin’t mean I’m a pouf”), he wears a goofy grin that is pure Ty. Cameron Holmes has landed the “supercalifrag’’ job of a lifetime. At just 12, the Minchinbury Public School student is playing the lead role of Michael Banks in Mary Poppins the Musical at the Capitol Theatre. “I feel very honoured and really happy to be in a musical with people I have always looked up to,’’ he said. Cameron was able to work with singer and actress Marina Prior who also starred in the production as Mrs Banks. The lead role is a natural fit for the young performer, who has trained in ballet at Donna Jean’s Danceforce. The dance school is run by Cameron’s mother Donna, who has helped him develop the skills needed for performing. Despite a busy performing schedule, he juggles school and tutoring and his friends and teachers have watched him perform.“There was a big reaction they were excited too,’’ Cameron said. Donna said nobody realised how big her son’s role was until they saw him perform. “He could have a big future he is only 12 but you never know,’’ she said. In 2011 he landed the role of Michael Banks in Mary Poppins the Musical. Cameron spent March and April rehearsing in Melbourne for the role. Although Alex first auditioned for the role of Tiny Tim, Theatre Centre producing director George Quick said he was so impressed he decided to cast him in a larger role. The Ghost was a more involving part, especially for an untried actor, but Quick said he was confident in Alex’s abilities. Alex’s father and mother, Rick Griffith and Donna Griffith, have used his involvement in the arts as a way to bring the family closer together. Rick Griffith has helped build stage props for original scripts Alex began writing last year, and both he and Alex’s mother regularly volunteer at the Theatre Centre.